This new collaborative project pairs one of the UK’s most gifted and unconventional drone artists, Chris Herbert, with Spanish sound artist Elías Merino. The duo were initially brought together by their shared interest in creating lushly textured soundscapes, but each has a very different process for arriving there: Herbert is quite fond of natural and non-musical "found" sounds, while Merino's work is primarily computer-generated. Their commonalities handily eclipse any potential aesthetic clashes though, as Folds sounds like an absolutely gorgeous drone album enlivened by a churning undercurrent of grainy textures and sneakily obscured small-scale kinetic transformations. I suppose that description could probably apply to much of Herbert's solo work as well, but Folds definitely feels like an extra layer of depth, textural complexity, and visceral power has been added to the picture. Merino's presence has taken something already wonderful and elevated it to a whole new level. 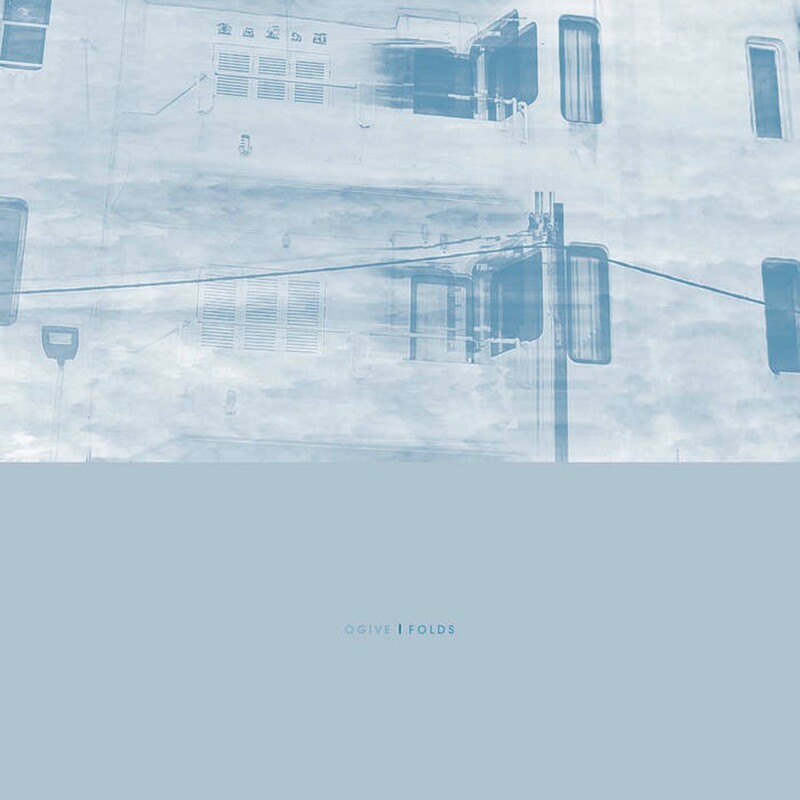 It feels exasperatingly reductionist to describe Ogive's work as "drone," even though that term is a perfectly apt one structurally: Folds' five pieces are all built from a fairly straightforward foundation of hazily dreamlike thrum, crackle, and hiss. Sadly, no one has yet coined a fitting genre name for something that is essentially drone music, but on a much larger and more transcendent scale, nor is there a special designation for drone that vibrantly buzzes with a dazzling ecosystem of intricate, dynamic details. Folds, however, delivers on both of those fronts from start to finish. As such, it demands to be played loudly, as it feels like a force of nature and should be experienced that way. On the opening “Dehiscence,” for example, Ogive evoke nothing less than a massive, crashing wave of beauty–it slowly rolls in with rumbling, seismic power, then becomes an overwhelming and completely immersive sensory experience. If a tidal wave washing over a town could be stripped of everything negative and viewed strictly as a slow-motion aesthetic phenomenon, it would probably be a lot like “Dehiscence,” completely transforming the landscape and creating an otherworldly and sun-dappled state of suspended animation: everything normally in the town is still there, but radically recontextualized and blurred into unrecognizability. At times, the underwater world of "Dehiscence" has pockets of violence and danger, but it all eventually recedes to leave only gently rippling pools and metaphorical dripping eaves in its wake. In essence, that tableau is what every piece on Folds seems to strive for (and achieve): taking elements of the familiar and transforming them into something alien, new, and weirdly beautiful...and doing it in impressively decisive and enveloping fashion. On the following "Isomerica," the illusion is a bit easier to deconstruct, as it sounds like a field recording of a clanking and grinding factory floor smoothed over with a languorous wash of shifting, blurry harmonies. It is not any less heavenly than its processor, however. In fact, it even transcends it in some respects, unexpectedly blossoming into what feels like a soft-focus and half-remembered fireworks display near the end. Later, "Refractaise" further highlights Ogive's unconventional genius for texture, as the bed of drones feels like an undulating and visceral machine-like hum that unpredictable swells into grinding and sizzling crescendos. There are also some ghostly sustained tones creating shifting harmonies, but it never sounds like there are any human musicians playing human instruments involved–it sounds instead like I am having an especially real and physical nightmare set in a haunted factory. Elsewhere, "Rifts" feels like a rhythmically pulsing sea of crackling radio waves and shuddering machinery. Gradually, it becomes increasingly disrupted by subterranean surges that cohere into a heavy new rhythm. That industrial churning ultimately gives way to a comparatively pastoral second half...sort of. The drones certainly subside to a roiling simmer and some happy ducks lend their voices to the scene, but it still takes a while before the rumbling subsides enough that it no longer feels like the ground might suddenly tear wide open at any time. The closing "Superhabitat" unexpectedly diverges a bit from the usual winning formula, playing up Ogive’s more straightforward drone aspects a bit more than the other pieces, but is not any weaker for it. Instead, it simply feels like a single sustained and undulating organ chord jacked up to engulfing immensity through plenty of grainy, distorted layering. It sounds a lot like prime Tim Hecker, but a Tim Hecker who found one perfect chord and simply decided to hypnotically ride it out into eternity. Naturally, a great deal of Folds' success is due to the seamless blurring together of both artists' distinctive and unusual approaches to pure sound: this album is instantly mesmerizing primarily because it feels like an immense and shuddering organic entity. Herbert and Merino are extremely adept at erasing any traces of themselves, and both have a seemingly infallible intuition for avoiding missteps. Any recognizable instruments, deliberate chord changes, or melodies would have unavoidably ruined the spell, regardless of their compositional utility. Consequently, all are nowhere to be found. Instead, Folds seems to have found a post-compositional path where both artists egolessly allowed their sounds and their tools to shape a "natural" flow. Of course, there is also a second piece to the puzzle: such an approach would just be a cool conceptual experiment if it did not sound great, so it is fortunate that Folds is also a rich, muscular, and vibrant tour de force of production skill. Lovely spectral harmonies and subtle, sharply realized textures abound, but they are always in service of a whole that often feels like being consumed by a heavenly avalanche. No one will make a better drone album than this in 2017.